There's nothing quite like a gigantic low pressure system blowing in off of the Pacific to generate powerful gusts, plenty of precipitation, and pounding hydraulics along the coast. Colder air rushing in off of the ocean can whip up gigantic waves along the surface and displace the warmer air along the coast, pressing it up until it condenses into clouds and rain. For some, fronts like this present the opportunity to hunker down and catch up on some work, reading, or indoor recreation while waiting out the storm. And while there's nothing wrong with that, we're fans of a different approach: try getting out in it for a bit to catch some truly natural special effects! If you think of these storms as contests between cold and warm fronts, the confrontations can be thrilling to watch as they unfold, especially if you're smart about your preparation and have selected a choice spot. In terms of readying yourself, the best first step is to remember that underestimating the strength of storm effects can be lethal. High winds, torrential rains, and gigantic surf all need to be taken seriously. Especially when surf is involved, safe observation points must be selected and reasonable distances must be observed; don't be one of the folks who, in the thrill of the moment, gets a little too close to the next big wave. Every location is different, and some spots may allow for more proximity than others. Still, the important thing is to stick to your spot and enjoy the show. You'll want good boots and rain gear to keep yourself sealed up...forget the umbrellas in high winds. If you're shooting photos, think hard about your location beforehand to select your lens. You'll want to keep your lens changes to a minimum given the salt and moisture in the environment. If you can safely approach a scene, go wide and prepare to get wet; if the spot is more dangerous to approach, be sure to grab a telephoto to cover the safe distance and yield those up-close results. A water repellant shell for your camera is highly recommended, both for the ocean spray and for the rain; these can be purchased or made at home with a little ingenuity and some plastic bags (just cut out a hole for your lens and viewfinder and shoot with your camera and hands in the bag). As for selecting a location, we've put together a list of 75 great spots to consider depending on the character and direction of the storm front. The links below are just the beginning; have a look at the featured adventures for a more complete set of suggestions. Of course, as with any dynamic process, weather is pretty tough to predict; a headland that gets pounded one week may see light surf through the next storm. Keep an eye on local forecasts and watch the radar to learn a little more about your local weather behavior. And don't forget to share your best shots in the comments sections for each adventure. Have fun and stay safe! 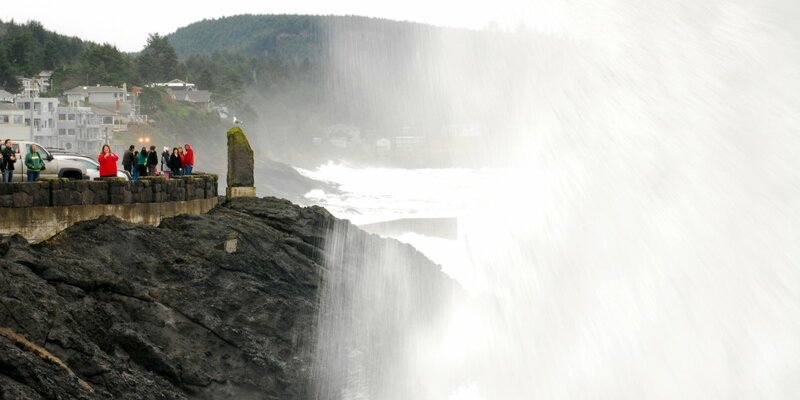 Big waves in Depoe Bay. Photo by Tyson Gillard. Staying in Florence, Oregon now. It's nasty.